Deemed a little ostentatious in some Western circles, tiaras remain popular with the so-called ‘new’ markets. 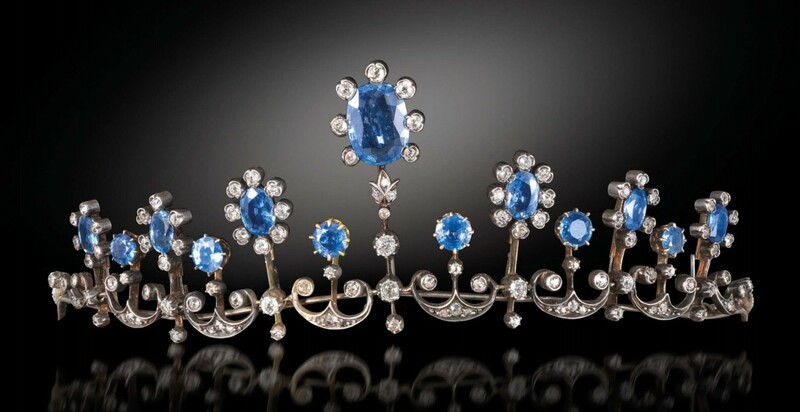 A late 19th century tiara set graduated sapphire and diamond clusters in silver and gold sold just over top estimate at £28,000 to a bidder from the Far East at Woolley & Wallis (25% buyer’s premium) in Salisbury on January 25. It was cased and could be taken off the frame to be worn as a necklace. “The Chinese demand for tiaras seems to have surpassed that of the young Russians previous dominant in this market,” said head of department Marielle Whiting. Also pictured here are three of the more eagerly-contested entries. 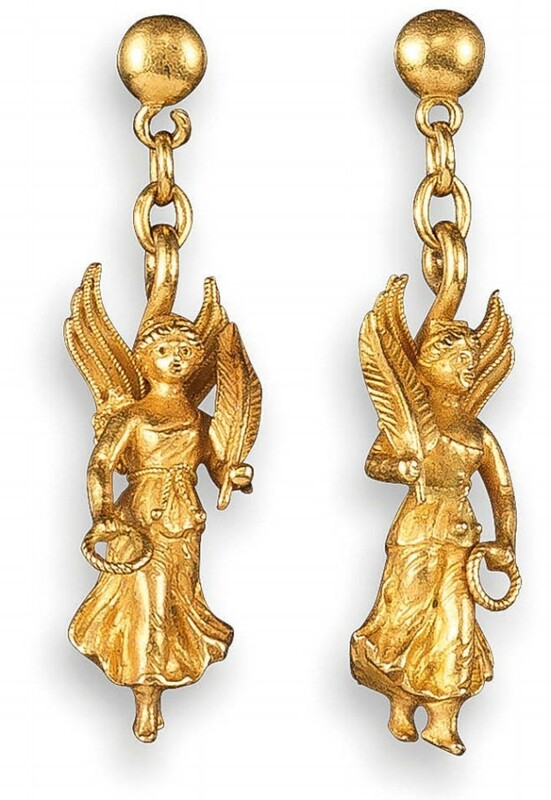 A pair of 19th century Etruscan style earrings modelled as figures of Nike were battled by the phones before selling privately at £3800 against modest expectations of £200- 300. The model is known in Greek jewellery from the 3rd century BC and a possible clue to their pedigree was a case by revivalist Carlo Giuliano. 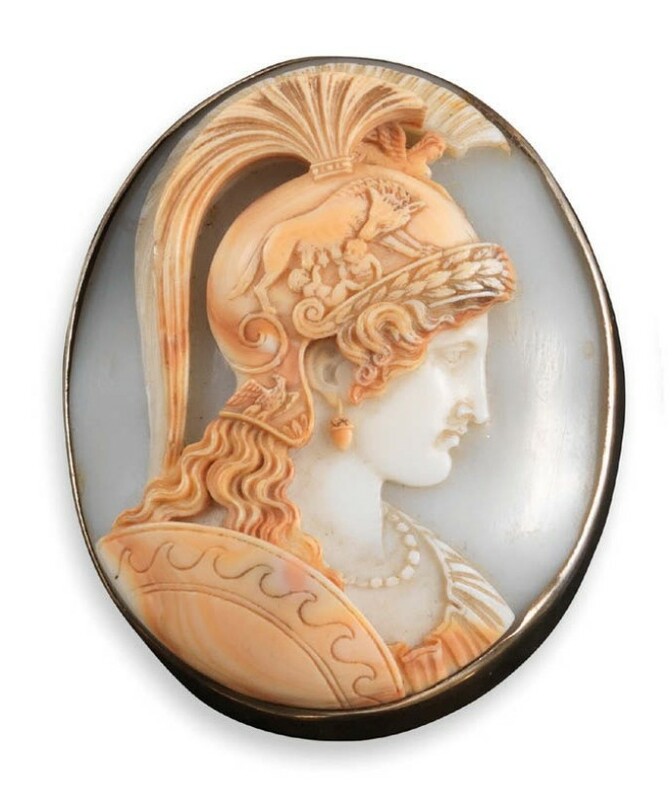 A particularly well-carved shell cameo brooch depicting Athena – her helmet with a carved depiction of Romulus and Remus – in a silver frame was also a flyer against the same estimate. It took £2400. 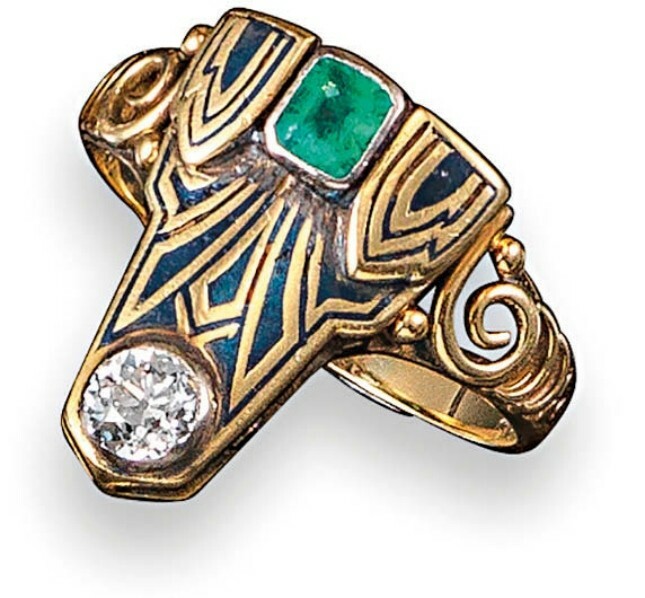 Estimated at £600-800, an emerald, diamond and champlevé enamel ‘skyscraper’ ring sold at £1900. Struck with the maker’s mark for Henry George Murphy whose workshop at the ‘sign of the falcon’ in Marylebone produced some of the best British Art Deco silver and goldwork, a similar example is illustrated in Arts & Crafts to Art Deco: The Jewellery and Silver of HG Murphy by Paul Atterbury and John Benjamin (2005). A novel addition to the sale was a series of Deco millegrain-set jewels commissioned in the 1930s by the actor Lupino Lane of ‘Lambeth Walk’ fame for his wife Violet Blythe. Each referenced Lane’s most celebrated roles, with a pair of diamond drop earrings incorporating the figure of Cockney barrow boy Bill Snibson selling at £2000 and a 1940s ruby and diamond spray and banner clip brooch titled for follow-up musical Sweetheart Mine sold at £3000. Lane’s granddaughter Sara was the consignor.